Godzilla: Vinyl Wars is a collaboration between Japan's classic sofubi manufacturers and cutting-edge toy maker Medicom Toy. Each release in Godzilla: Vinyl Wars is a reproduction of a classic Toho sofubi from the 1960s through today, released legitimately for Western collectors for the first time ever. These hand-crafted, hand-painted figures inspired the designer toy movement, and will hold a place of high honor in your collection! 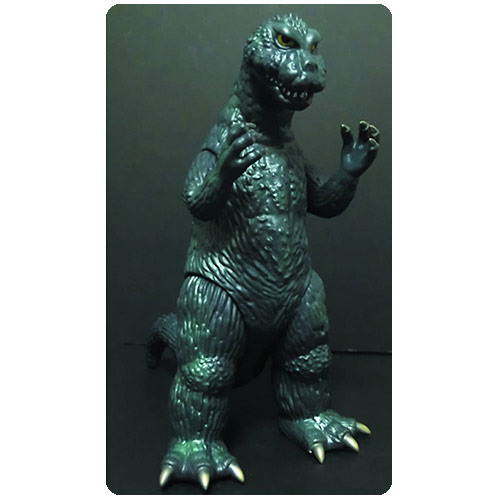 2002 saw the initial release by Marmit of their Monster Heaven 1961 Godzilla sofubi. Since then, Marmit has released more than 20 variants, few pieces of which have made their way Stateside. Now, Marmit issues this classic look for North American audiences in a greenish-grey colorway, with the edition size not to exceed to 200 pieces! Ages 15 and up.